HJ: When looking at the grand cycles of time that we exist in, it becomes very easy to determine where we are collectively headed, especially in terms of consciousness. It is not widely spoken of outside of esoteric, archeological, mystical and sometimes academic circles, but there are, in fact, grand cycles of time, also known as ‘ages’ or ‘yugas’ that determine the overarching patterns and development of consciousness in linear terms that have been studied and developed in great detail over the course of thousands of years by both ancient societies and modern scholars. While we typically think of our Sun as stationary, it is actually in a massive orbit with another star system, which takes about 26,000 years to complete. As our Sun (with the rest of the solar system in tow) gets closer in proximity to the sister star we are in orbit with, the electromagnetic and cosmic radiation emitted by that celestial body bombards Earth in greater and greater quantities, affecting consciousness in a ‘positive’ manner. Consequently, as we move away from this sister star, the electromagnetic and cosmic rays subside substantially and consciousness can potentially recede with it, though this is not always set in stone and largely depends on the heights of consciousness reached in the ascending phase. The inspiration for this article comes from my almost nineteen years of research into the Great Cross of Hendaye and the French alchemist Fulcanelli. The unknown, anonymous, alchemist Fulcanelli in his masterpieceThe Mysteries of the Cathedrals first brought the cross at Hendaye, France to the world’s attention. While the details of this research can be found in other articles written by myself and in the two books I co-authored,1 it can be stated that the Great Cross at Hendaye appears to be describing not only the end of the great four ages of the Hindu Yuga system but also the four ages of alchemical chronological time keeping. According to the cross at Hendaye, the Iron Age, or the Kali Yuga, will be coming to an end with the galactic alignment on the winter solstice of December 21st, 2012. According to the mythology of the Yuga system, there are four ages of life and time on our planet. It is important to remember there are many cycles within cycles in the Hindu Yuga system so the years mentioned next may have to do with a larger cycle than the one addressed in this article. Perhaps the huge number of years referred to below is the cycle of the solar system as it circles another star, or perhaps it is a portion of the great cycle of one revolution around the galactic centre. The first age is the Satya Yuga or the Golden Age, according to Fulcanelli. The Hindu texts tell us that this age lasts 1,728,000 years. This is an age of extreme splendour when the beings on our planet appear to live much longer than they do now. In this age there are no wars, famines, strife or evil. The second age is called the Treta Yuga, or the Silver Age. As in the second law of thermodynamics, or entropy, things begin to slip in this age and the beings on Earth begin to deteriorate. This slippage, at least during this second age, is the beginning of corruption, and evil is introduced into the planetary sphere. This age lasts 1,296,000 years according to the Vedic texts of India. The third age of this cycle is called the Dvapara Age, or the Bronze Age. This is the beginning of the ‘fall’ of humanity. In this age corruption comes on more fully, evil begins to spread, and things start to fall into disharmony. This age lasts 864,000 years. What is important to understand while discussing these huge numbers found in the Hindu texts is they are describing the four ages within a context of understanding that each successive age is shorter than the previous age. The Satya Yuga, or the Golden Age, is one quarter longer than the Treta Yuga, or the Silver Age. The Treta Yuga is one quarter longer than the Dvapara Yuga, or the Bronze Age. Understanding these differences in the lengths of the ages becomes important to the following discussion. What Fulcanelli appears to be saying here is that the precession of the equinoxes is to be divided into four distinct ages of 6,480 years each (4 divided into 25,920) or, to round off the figures to approximately 6,500 years each. This is also interesting because the zodiacal cycle, which lasts 25,920 years, has four fixed signs. These are the signs of Aquarius, Taurus, Leo and Scorpio. These four signs are separated by 6,500 years each. Also in the Book of Ezekiel and in the Book of Revelation we are told of the angel with four faces. This angel has the face of a Lion (Leo), a Bull (Taurus), a Man (the angel) and an Eagle (in older times Scorpio was represented by an eagle instead of a scorpion). Apparently, according to Fulcanelli, both of these books in the Bible are warnings and messages about the four quadrants of the precession of the equinoxes and appear to be telling us that there is some kind of great change whenever we arrive at one of these four signs. Of course it is well known that we are currently entering the Age of Aquarius. The Cross at Hendaye and Fulcanelli are telling us there are tremendous changes to be found here on Earth when we enter into one of the four fixed signs. Apparently these changes can be cataclysmic. It is well known in modern physics that four dimensional space, of which time is an aspect, is in the shape of a hypersphere (see Figure 3). This hypersphere appears similar to the shape of a donut, or a bagel. The energy, or the flow of the energy stream, within this hypersphere works like this: As shown in the illustration, the flow comes out of the bottom of the sphere, winds its way up around the outside edge, crosses the outside equator of the torus sphere and moves towards the hole in the top of this torus. The energy flow then begins to fall through the top of the hole and begins to spin in a vortex. This energy flow continues until it comes out of the bottom side of the torus where the energy flow begins its outward expansion again. This flow is continuous and, in a sense, infinite. The Four Dimensional Hypersphere torus is also represented by the hypercube. 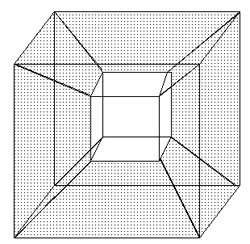 A hypercube is a cube within a cube according to physicists. Essentially this cube, also called ‘The Cube of Space’ or the ‘Tetragrammatron’ by the alchemists, is a straight edged version of the donut shaped hypersphere (see Figure 2). Scientists love to be able to construct objects using straight lines, so they have created the hypercube to help them better understand the hyperdimensional universe that surrounds us. Alchemists, however, like to use the curved lines of nature, so the donut shaped torus or hypersphere, is a better, more natural visual description of hyperdimensional space and will be the one I use in this article. In order to begin to comprehend the topographical nature of time, it is very important to understand the guts of this hyperdimensional sphere. By the ‘guts’ I am referring to the vortexes that make up the energy flow running through the centre of the hypersphere. As the energy flow begins to fall into the vortex that runs through the centre of the sphere, it takes on the shape of a tetrahedron. A tetrahedron, as shown in Figure 4, is the building block of three-dimensional space and is the founding member of the Platonic Solids. The tetrahedron is the simplest object that can be created in three dimensions. The only object with just four sides, the tetrahedron is also shaped like a vortex. Let us digress for a moment and discuss vortexes. Back in the Midwest of the United States, where I come from, there is a place called Tornado Alley. This is the flat Great Plains that stretches from Texas to the Dakotas. Each year this area is visited by numerous tornados, which wreak havoc on the farms and towns of this area. These tornados usually start in May and last until early August. Having witnessed several tornados in my early years I became fascinated by them and was once even a ‘storm chaser’. In my young and foolish days I used to chase after tornados with my Bolex 16mm camera in order to capture them on film. I became very familiar with these lethal vortexes. But understanding tornados also helps us understand vortexes and the density of forces in the hypersphere. Tornados (and also hurricanes) are made up of air like that which surrounds us all the time. But as the air begins spinning it takes on a strange solidity. While the swirling air at the top of a tornado is somewhat dangerous, it is the spinning air near the surface of the ground that is really dangerous. Near the tip of a tornado, where it is in contact with the ground, the air takes on the quality of solid iron. The tips of tornados can rip buildings apart, throw cars and trucks thousands of feet, and punch chaffs of wheat into the very centre of trees like a bullet. As the air spins more violently, the tip of the tornado vortex becomes as strong as 50 locomotives engines and possesses the density of the hardest of metals. Yet it is just comprised of air molecules. But these molecules are spinning so quickly they create a mass that is extremely powerful. It is the spin of the air that causes it to densify and take on the solidity of metals. Getting back to the central core of our hyperdimensional torus, we can understand the vortexes inside this sphere and how time unfolds by using the tornado analogy. As the energy flow begins to dip down into the top of the tetrahedral shaped vortex, it begins to spin. As the energy flow descends, its spin becomes more rapid and compressed. Like a tornado, as it reaches further down, the tip of the vortex ‘hardens’. It could be said that his hardening of vorticular forces is what makes up the solidity of our three dimensional space. Each human, plant, animal and indeed every planet and star alike are the hardened tips of hyperdimensional vortexes, which are flowing all around us constantly. Like air, these hyperdimensional forces are pretty much invisible to us. It is only when these forces coagulate into a spinning vortex that they can be seen and felt. It is through the rapid spinning of four-dimensional space that the solidity of the third dimension is actually created. The mystics from all great traditions know this and they realised these inner dynamics of the fourth dimension as it interacts with the third dimension. The fourth dimension is the surrounding sphere and the third dimension are the tetrahedral vortexes that make up the central core of the sphere. To the ancients, four-dimensional space was called ‘spirit’ and three-dimensional space was called ‘matter’. So what does this have to do with time and the topography of time? Remember the dilemma we face in trying to make the four ages of the precession match up with the Ages or Yugas from the Hindu system? By attempting to make the two into one we can not only understand the topology of time, but also we can map time like the ancients and we can know where we are in the river of time. As shown in illustration Figure 3, imagine that we are coming through the very centre of where the two tetrahedral tornado vortexes intersect at the very centre of the inner hyperdimensional sphere. Moving down the bottom vortex towards the outside surface of the sphere, each spin in the vortex takes longer and is wider and slower than the previous spin in the vortex. In other words, the energy flow expands after it passes the ‘null’ point in the very centre of the hyperdimensional sphere, or torus, where the tips of the two tetrahedral vortexes touch. Now as the flow of energy falls down the vortex towards the null point at the very centre of the sphere it begins to harden as it spins faster and faster. This goes on and on until the vortex is so hard it is like iron. This is how the fourth dimensional forces create three-dimensional reality. As the vortex spins faster and faster eventually it compresses down to the point where it has nowhere to go but outwards again. This occurs at the null point in the centre of the sphere and the energy flow now begins to once again expand. The Golden Age is the time period that starts at the null point in the centre of the sphere and continues through the bottom vortex. As the energy flow expands outwards time appears to slow down. The entire period of the Satya Yuga, or the Golden Age, continues as the energy flow goes down the bottom vortex and rounds across the top of the sphere. It continues expanding until it arrives at the equator. About two thirds down in the upper vortex, where the energy flow is spinning so fast that it becomes as solid as iron, is the beginning of the last Age, the Kali Yuga, or the Iron Age. This spinning continues to gain density, compression and speed as it races towards the central null point in the very centre of the sphere. As it approaches this null point the forces become unbelievably fast, violent and dense. It is only when these forces achieve maximum density and they can no longer compress any further that they begin to suddenly flip and begin the expansion of the flow. This happens in an instant. This is the shift from the Iron Age, or the Kali Yuga to the Golden Age, or the Satya Yuga. The borderline between the Iron Age and the Golden Age is the most distinct border in this topographical illustration of hyperdimensional time. It is the most jarring and is instantaneous. Take notice of the hourglass shape of the two tetrahedral vortexes inside the hyperdimensional sphere. Is this why Fulcanelli tells us about the hourglass in the quote at the beginning of this article? In Hindu mythology the God Shiva dances the world into and out of existence playing his dhamaru which is a two sided drum shaped like an hourglass. Notice that, like the number of years in the Hindu Yuga system, the distance travelled through our ages in the hypersphere is similar; the Golden Age, which is the distance between the null point in the centre and the outside equator is twice the distance as that travelled through the Silver Age which is the distance from the equator to the top of the lip of the upper vortex. Equally, the distance travelled from the top of the vortex to two thirds down, which is the Bronze Age, is half the length of the Silver Age. Finally, the tip of the vortex is half the length of the Bronze Age. Also remember, even though the distance travelled is much further in the Golden Age than it is in the Iron Age, the number of years it takes is the same. It takes 6,480 years to go through the Golden Age just as it takes 6,480 years to go through the Iron Age, but it feels much different. In the Golden Age each second, each day, each month and year appear to be longer than the previous day, month and year. Time is expanding in the Golden Age and with that expansion the anxiety and tension of the Iron Age disappears. It is a paradise, especially to those who may have survived the passing through the wormhole, or the null point at the centre of the hyperdimensional sphere. The shamans in Peru tell us that we are approaching the Pacha Cuti, which means literally ‘the world turned upside down’. They say that it will arrive in the year 2012. This is also the year when the great Mayan calendar reaches its end point. The cross of Hendaye is quite explicit in saying we are reaching the very end of the Iron Age. I would suggest that the null point, or the wormhole at the very centre of the hypersphere, is very likely the 2012 date. Our hypersphere appears to be regulated by the periodic alignment of the galactic centre with the Sun. This also matches the four fixed signs of the zodiac and explains why the Christian tradition is preparing for the endtimes. It is through our understanding of the Four Ages, the fixed signs of the zodiac, and the Yuga system that we can finally appreciate the message our ancestors have handed down to us. We are about to pass through the Star Gate, the wormhole, and the null point of hyperdimensional space. At the very core of all the great spiritual traditions to be found across the planet from the ancient Egyptian to the Incan and Mayan, Indo-Tibetan, Alchemical Europe and even the Hebrew Kabbalah lies the knowledge of the secret of the alchemy of time. Unencumbered by the excessive demands, stresses and speed of the modern age, our ancestors spent lifetimes in contemplation of the essential mysteries of our world. One of the great mysteries they discovered was that time is not stagnant or linear but flows in great transformative cycles. In fact, it is only recently modern historians have begun arguing that time travels in a straight line. Within the limited period of historical examination these modern historians are viewing a snap shot of history and believe this snapshot represents the entire picture. But does it? The alchemists of Egypt and Medieval Europe knew that time moved in great elongated cycles, and that each part of the cycle had a ‘quality’. This quality shaped and reformed the world. Just as sunrise has a different quality from midnight, so too does each aspect of the great cycle possess a quality that distinguishes it from other parts of the cycle. When the cycle of time changes, so too do events change here on Earth. At the heart of the secrets traditions of the Egyptian and Greek mystery schools they knew that a process, which they called the precession of the equinoxes, measured the Great Cycle or the Great Year. What they understood was that the stars in the night sky are not fixed. Through their long observation and meditation upon the heavens they came to realise that the stars and the constellations were slowly changing their place in the sky above us. Creating the zodiac to assist them in these huge measurements of time they used the twelve signs to act as a giant time clock. Through this they began to understand the Great Cycle. They realised that it took 2,160 years to move through each sign of the zodiac and that it took 25,920 years for the equinoxes to move through all 12 signs. The creation of the Great Year of nearly 26,000 years gave them a clock that allowed them to measure time. They then came to understand that each of the signs, or places on the clock appeared to bring forth changes in the quality of life here on Earth. So they came to realise that every 2,160 years the quality of time changed. They also began to understand that the four quadrants of this great chronological clock appeared to bring forth even sharper changes in the quality of time. The four signs associated with these four quadrants are the signs of Aquarius, Taurus, Leo and Scorpio. There does seem to be some historical linkage between this idea that passing through the edges of these four signs brings great changes here on Earth. About 6,500 years ago we passed through the sign of Taurus. Coincidentally, the human race began domesticating cattle, building walled cities, developing agriculture, fighting wars and beginning the city-states that would evolve into governments and monarchies. Thirteen thousand years ago, as we passed through the Age of Leo, great changes occurred including a dramatic climate shift as the ice ages began to end. The extinction of many animals including the Woolly Mammoth, the Saber Tooth Tiger, the Giant Tree Sloth, and many other species happened at about this time. Interestingly, according to anthropologists, the emergence of Cro-Magnon Man appears to have occurred about 26,000 years ago, the last time we passed through Aquarius. The Great Cross at Hendaye is a 350-year-old alchemical monument to the end of time. It sits in a churchyard in Hendaye, France. The Great Cross at Hendaye appears to be a symbolical construct that explains this science of the cycles of time. The Cross at Hendaye describes the extraordinary changes that are about to occur in our present era. It speaks of the end of our current Age of Iron and the creation of a coming Golden Age. The great cosmic time clock in the sky is changing. We are now entering the quadrant of Aquarius. From what the alchemical Cross at Hendaye is saying, this change is sure to have a dramatic effect on our species and on our planet. The Peruvian shamans living high up in the Andes Mountains have come down to tell us that a new species of human being is about to appear. They call this being ‘Homo Luminous’. They tell us that forerunners of Homo Luminous are already among us right now. Like Cro-Magnon Man of 26,000 years ago, the last time we passed through the cusp of Aquarius, so too now a new human is emerging. This new human will possess entirely new qualities that we do not have. The great Avatars, Jesus Christ, Krishna and many others may have been early arrivals for this newly emerging species. Aquarius is the only one of the four quadrant signs that is symbolically represented by a human, and this human carries a container of water. This symbology is interesting as DNA can only be activated in water. So even the symbolic nature of the sign of Aquarius seems to suggest a change in the genetic structure of the human race. Our spiritual existence is really a unique combination of free will and predestination. While we possess the ability to act freely within the moment, there is little we can do about the larger cycles of time and the qualities that emerge at the cusp of each of the four great signs. So as the hand on the great cosmic time clock passes into Aquarius one can expect massive changes to occur. While the ancient art of alchemy is concerned with many aspects of our existence including the extraction of light from plants and minerals, the transformation of the dark lead of our physical being into the pure gold of enlightenment and much more, alchemy also is a symbolic ontology concerned with the observation in the changes of the ‘quality’ of time through the 25,920 years-long duration of the Great Year. 1. See www.jayweidner.com; The books A Monument to the End of Time: Alchemy, Fulcanelli and the Great Cross and Mysteries of the Great Cross of Hendaye: Alchemy at the End of Time are authored by Jay Weidner and Vincent Bridges. 2. For more information, see ‘Tolkien at the End of Time: Alchemical Secrets of the Lord of the Rings’ by Jay Weidner and Sharron Rose in New Dawn No. 82 (January-February 2004), and ‘Reflections on the Cycle of the Great Yuga’ by Sharron Rose at www.sharronrose.com. 3. For more information on the luminous energy body, see my films Healing the Luminous Bodywith Dr. Alberto Villoldo, ArtMind with Alex Grey and Yoga of Light with Sharron Rose. 4. See ‘Alchemical Kubrick: 2001: The Great Work on Film’at www.jayweidner.com. Jay Weidner is a writer, filmmaker and Hermetic scholar. He is the co-author of Mysteries of the Great Cross at Hendaye: Alchemy and the End of Time and A Monument to the End of Time: Alchemy, Fulcanelli and the Great Cross. His documentaries include Artmind: The Healing Power of Sa­cred Art, featuring Alex Grey, Healing the Luminous Body: The Way of the Shaman, featuring Dr. Alberto Villoldo, Healing Sounds, featuring Jonathan Goldman, The Secrets of Alchemy which discusses the Cross at Hendaye, and many more. For more information on his work, go to www.sacredmysteries.com.